Up Hosting Review 2019: Is Up Hosting a Good Hosting? Although Up Hosting shows some promise as an Israeli provider of Windows and Linux shared hosting plans, it offers few freebies, and (in my experience) it doesn’t respond to prospective customer queries. Up Hosting is one of Israel’s pioneering cloud hosting providers. Using servers located in Israel, it strives to provide thousands of private, institutional and business customers with innovative cloud hosting solutions. But it’s not all good news. The Up Hosting website is in Hebrew. Up Hosting offers three Windows shared hosting plans, and four Linux shared hosting plans, with similar specifications for the entry-level plans, including 500 MB storage space, 5 GB monthly traffic, and five mailboxes. However, the top-of-the-range ‘Ultra’ Linux shared hosting plan stands out by offering 5 GB storage space, 100 GB monthly traffic, and fifty mailboxes. All web hosting packages feature the Plesk control panel that allows you to manage your website and hosting accounts with ease. This multi-language control panel also features automated backup capabilities. You don’t get SSL included for free, so you have to buy an SSL certificate separately, but you do get one-click installation scripts for Joomla, Magento, Drupal, WordPress, phpBB, and many more popular apps. Up Hosting’s hosting packages don’t come cheap, especially when you consider that you get no free domain, no free SSL certificate, no free website builder, and no free website migration. It’s equally disappointing that there is no free trial period and no money-back guarantee as far as I can see, but you only have to commit to monthly billing, so you should always be able to get out within 30 days. Signing up is merely a matter of filling out a simple registration form, paying with any major credit card, and waiting for authorization to use your hosting account. Customer support (not 24/7) can be accessed by telephone, ticket, and email, but there is no live chat. Unfortunately, I had still not received any responses to my exploratory email and test support ticket after three days. The lack of any pre-sales response wouldn’t be so bad if there were some kind of knowledge base for self-support, but there isn’t. While there’s a lot you could like about Up Hosting’s slightly expensive Windows and Linux shared hosting plans, for me, the vendor falls down on a few of the basics. You get none of the usual free features, and I got no responses to my initial approaches. 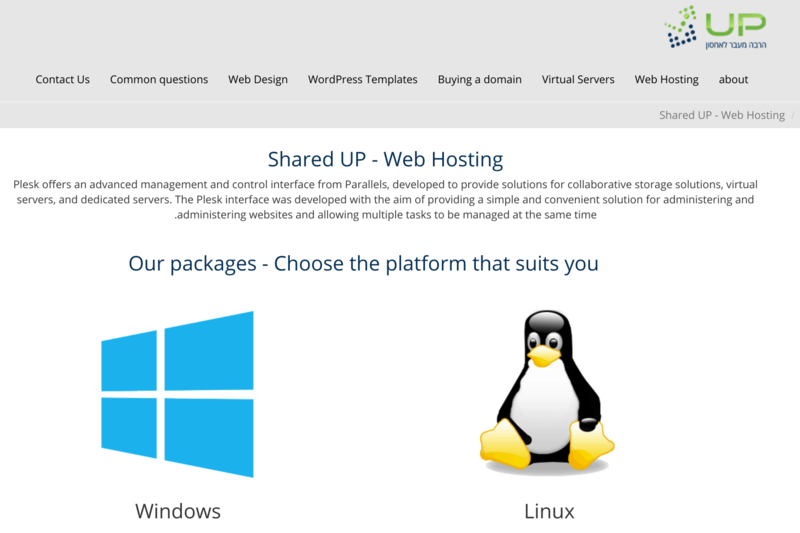 For Windows and Linux shared hosting in Israel, look up Up Hosting. Wondering how Up Hosting stacks up against other Web Hosting companies? Enter any other Web Hosting company and we will give you a side-by-side comparison.